Mr. Omer Tarzi, mr. Zaid Siddiq, grandsons of Mahmud Tarzi, ms. Malalai Wardak,coordinator of MTCF, doctors from Turkiye,officers from Edu Ministry,students and school management gathered in Mahmud Tarzi High School, at Mahmud Tarzi house. Principal Fada Mohammad Danishjou organized mewlid and khatim for his soul with hafizs/prayers at his home. Then there was a conference in the school hall. Teachers, edu officers, mr. Tarzi made their speeches in this commemorative ceremony. H.E. dr. Mohammad Azam Dadfar, Minister of Higher Education in his welcome speech gave his gratitude to everyone who participated at the conference. In his speech,he underlined the different aspects of Allama Mahmud Tarzi and his important meaning to our country. 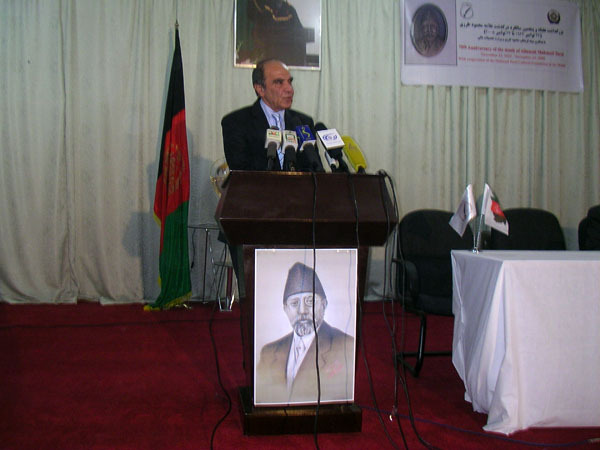 He also pointed on Mahmud Tarzi’s efforts to develop Afghanistan with his deep patriotic and modernistic approaches. He called him as a great scholar of the country. The Minister thanked to mr. Omer Tarzi, to establish MTCF, foundation of Mahmud Tarzi in Afghanistan.He said he was happy to meet Tarzi family in Istanbul and to knew the last child of Mahmud Tarzi, pcess Amina with the children of King Amanullah&Queen Soraya. After his speech he gifted an original Afghan long cape to mr. Omer Tarzi and mr.Tarzi presented MTCF silver medallion to him in memory of the day. 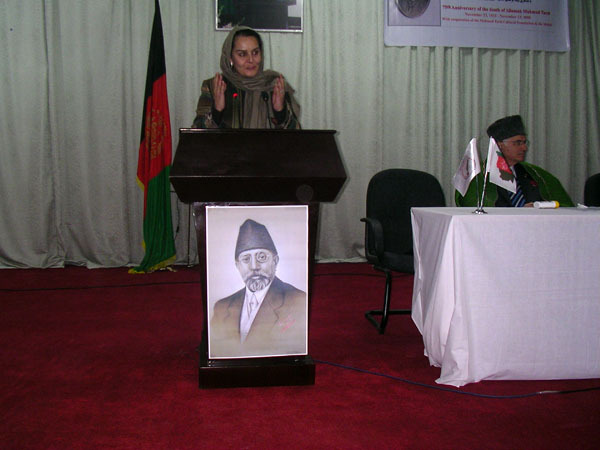 Mrs. Fatima Ghilani,president of the Afghan Women’s Council thanked to the organisation and talked about the influences of Queen Soraya to the Afghan woman. She mentioned the efforts of Shahzadekhanum Leyla and pcess India’s with their ages over 70, bring valuable help to our people. 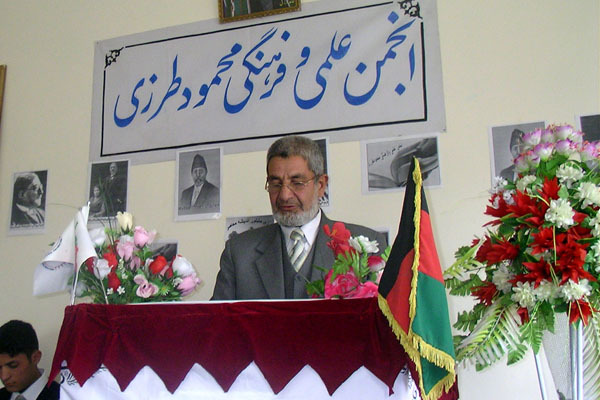 Gharwal, Director of Journalism Faculty,Kabul University shed light on different journalism aspects of Mahmud Tarzi and called him as a first founder of the newspaper, Seraj-ul Akhbar in the country. Prof. Murat Dikmengil, dean of the Trakya Medical Faculty in Turkiye made a fruitfull speech and “this is my first visit to your wonderfull country and am glad to be here with this important occasion ,75th memorial anniversary of Mahmud Tarzi. We visited the Lycee of Mahmud Tarzi, yesterday and there was a khatimpray ceremony for Mahmud Tarzi and we were there” he added. He showed his close interest for the future collaborations with the Kabul Medical University. 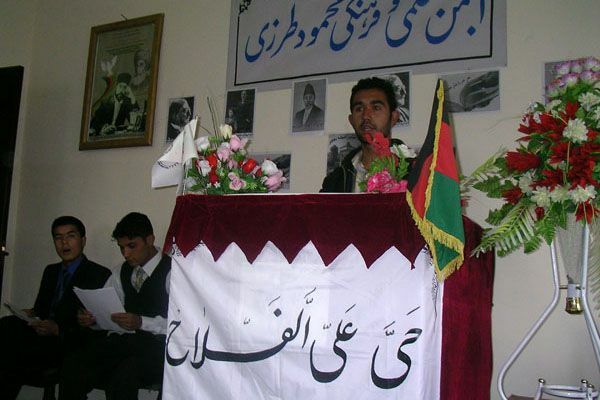 Zafar Khan Durani, a scholarship student of MTCF also gave his speech about the meaning of Mahmud Tarzi to the Afghan youth. The event was concluded with the prayer by mr. Mushkaat, a teacher in Mahmud Tarzi lycee. 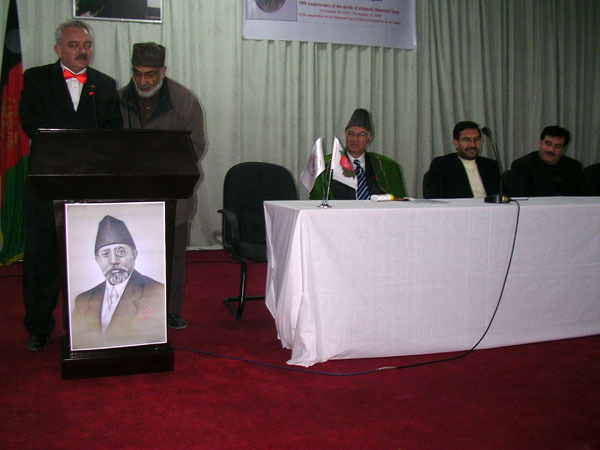 It is a great pleasure for me to be here in Kabul today to pay our respect to Allama Mahmud Tarzi, 23rd Nov. 2008. It is the anniversary of his demise since 75 years and we remember his personality in the 75th memorial anniversary programme of him. With this occassion I extend my deep respect and sukran to minister of higher education, my dear brother, H.E. dr. Dadfar who kindly accepted to organize today’s event, immediatelly after our request. I would also like to express special thanks to the respected speakers are giving their valuable speeches about Mahmud Tarzi to all of us and sharing with us. Today we gathered here to respect a man who brought light to the Afghan nation about 80-85 years ago. He was the father of journalism, a respected diplomat, the first foreign minister and ambassador. Besides these; He had a strong pen, wrote prose and poetry for his people and for his country, translated many books from other languages to bring the good winds to his people. Today is a very important day in Afghan history. After many years, this is the first official memorial celebration ceremony for Mahmud Tarzi and for his memory at this day. We, as a Mahmud Tarzi Cultural Foundation management did periodical ceremonies in front of his tomb since many years in Istanbul. 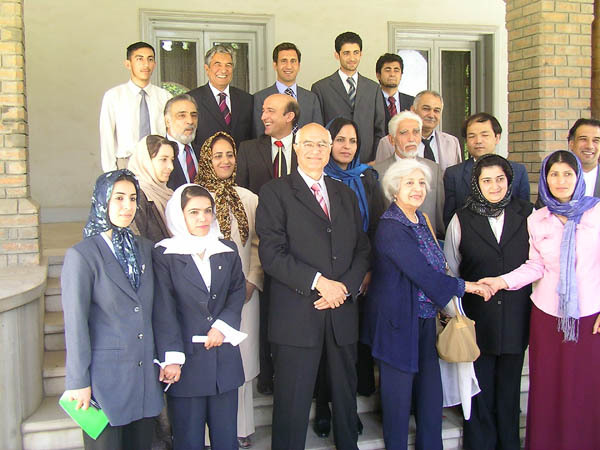 There were quests, friends, ministers from Afghanistan time to time shared their respect with our family. But it is the first official one happenning in Kabul, Afghanistan, today. In my speech at the Aug memorial seminar, organised by Foreign Affairs in Kabul, I said “The schedule of this memorial period will last until the 23rd November 2008 in several foreign countries and the closing ceremony will be held in Istanbul in front of his tomb with a serial of conferences.” But it is a very good opportunity that we are here, in his country, paying our respect to him. We shall organise the closing ceremony in front his tomb with all of you in the beginning of April2009 insallah ! There will be a joint program of Istanbul Literature Faculty together with Kabul Literature Faculty including international scholars. MTCF is organising this event as a Mahmud Tarzi International Forum and many scholars, ustads and danismends will be invited to this important forum. With these activities our grandchildren will learn more about him and his struggles, what good he had done for his country. 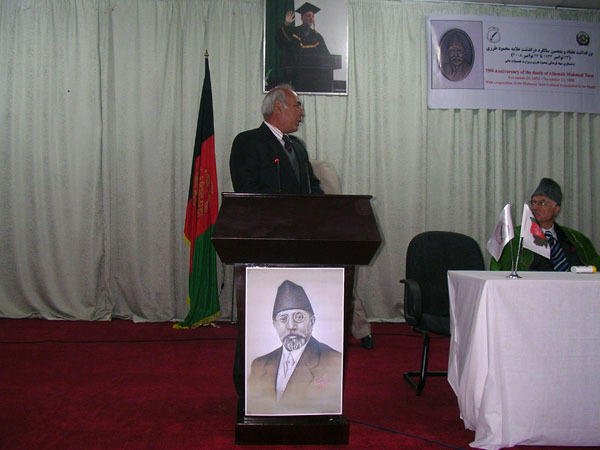 Mahmut Tarzi was a man who felt himself responsible to bring civilization, modern state management philosophy and more healthy living style to his people.It is therefore most appropriate that this event is taking place in Afghanistan, a country rich in cultural heritage and pluralistic traditions. This time, my visit to Afghanistan our foundation organized a second humanitarian program with 6 doctors from Trakya Unv. Med. Faculty, including the dean of the faculty. They did excellent work at Ataturk Hospital and we visited minister of Higher Education, H.E. 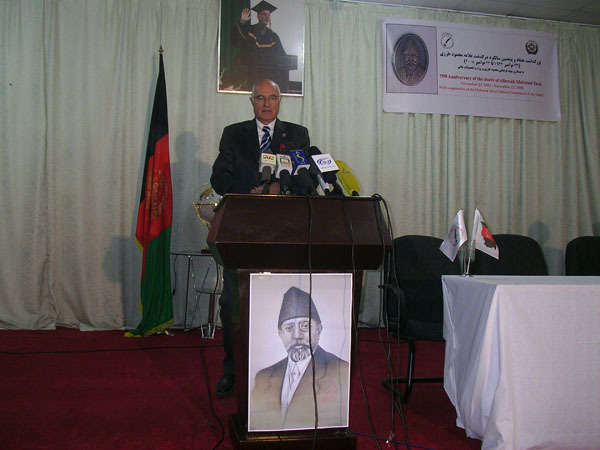 Dadfar, my brother and president of the Kabul Med Unv. prof. ObaidUllah Obaid and his premises then to minister of Public Health, my dear friend Fatimie saheb. We also visited Rabia Balkhi Hospital which has excellent conditions among the others, and Ali Abad – Ibni Sina – Maywand Hospitals. Trakya Unv. will continue to work and help to some of these hospitals with the exchange patient and technicians/doctors programs and to support with medical materials. They will open their faculty to Afghan counterparts. With this occasion once again, I want to thank to prof. Dikmengil, dean of the faculty and his volunteer group for their very profitable work they had done in Afghanistan. There are approximately 1. 476.233.470 muslims living in our planet. 1 billion in Asia, 400million in Africa, 44 milyon in Europe and 6 million in American continent. Five to one is a muslim in total world population. For one hindu there are two muslims, for one budist there are two muslims and for one jewish there are 100 muslims in this world. Did you ever think that why muslims are powerless since they have a huge manpower or another word it is a crowd population. The answer of it is in the OIC(Organisation of Islamic Conference) reports. There are 57 members in OIC and number of total universities are 500 only in these member countries. 3 million muslims to each university. Only in United States there are 5.758 universities. According to UNDP reports reading/writing ratio in christians world is 90 percent and 15 christian countries percentage is 100 and in islamis countries this ratio is 40 and there is no 100 percent reading/writing in any of the muslim country YET! In total productive income is $ 500 billion in Saudi Arabia,United Arab Emirates, Kuweit and Qatar and most of it is cruide oil. It is more then $ 1 billion in Spain and in budist Tailand is $ 545 million national productive income in good and service field. And worst one is ratio of the GNP of islamic countries in total number of world is become less in every year. Now, please analyze Allama Mahmud Tarzi and his ideas under the these realities and support it to bring developing activities to our country, to our society with your individual movements. We miss him very much! I, again to give my deep sukhran to the minister of Higher Education with the appreciations of members of the trustees of the foundation to realise this event. I also extend my appreciation to dr. Mousavi and his team to organise this conference and make it a perfect one. I wellcome you all with my deep ehteram. God bless Afghanistan and Afghan people ! 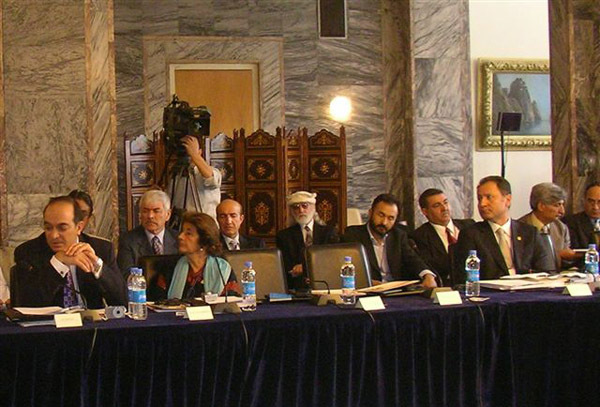 Commission of the 75th Memorial Activities of the Mahmud Tarzi (CMAMT) gathered in Foreign Affairs hall. Mr. Tarzi, Pcess India and mr. Habib Zikria were the participants from MTCF Board of Trustees. mr.Ghulam Sakhi Qayrat and mr. Yasin Rasouli were from Ministry of Foreign Affairs, mr. Hamed Elmi and mr. Wahid Noori from M.of Education,dr.Sayed Askar Mousavi from M.of Higher Education and dr. M. Halim Tanwir was from M.of Culture and prof.M. 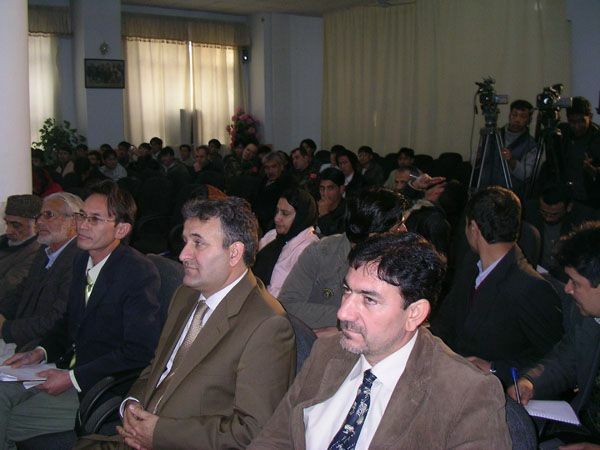 Kabir Nezami,dean of Lang&Literature Faculty of Kabul and prof./pohan doctor/ Moh. Hussain Yameen are the members of the committee. Committee decided to start the memorial programme on 23rd of August 2008 and will be end on 23rd November,2008. 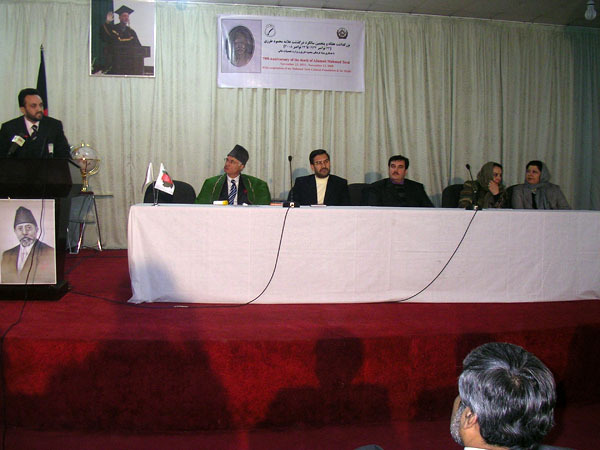 next CMAMT will gather on 23rd June 2008.
International conference&seminar for Allama Mahmud Tarzi being held in Kabul by Afghanistan Foreign Affair under the title of “The Commemoration of Allama Mahmud Tarzi and Moh. Wali Khan Darwazi” on 23-24 August, 2008 / 2-3 Sombola 1387. Conference begun with the message of President Karzai, then H.E Spanta wellcomed to the participants and pointed out of the importancy of Mahmud Tarzi’s influences to Afghan nation. At the openning ceremony in the first session there was a video clip of King Aman Ullah’s speech for the Afghanistan Independence in 1919, then pcess India thanked to H.E. Spanta and participants&quests. Mr. Omer Tarzi, President of MTCF and grandson of Mahmud Tarzi made his openning speech. (find it in the speechbox). In his speech first he thanked to the Foreign Minister dr. Spanta to organize this historical event. He then, especially pointed out of the lack of the young generation’s losses of their childhood in Afghanistan and presented a part of the project of the street children care program. With this occasion we met very distinguished scholars, diplomats, officials, friends in this meeting and had a chance to exchange ideas for the benefit of MTCF for its future programs. 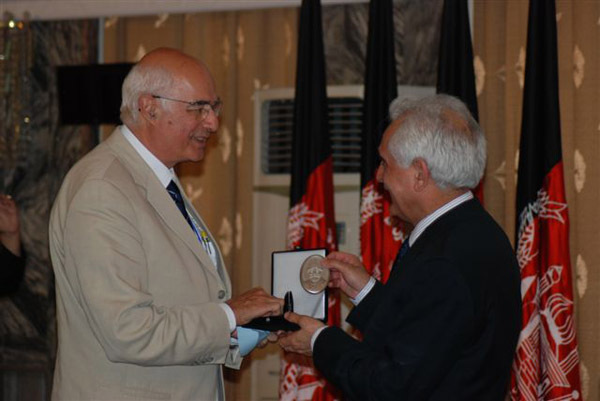 MTCF appreciates dr. Spanta’s personal and sincere interests to each member of MTCF during our stay in Kabul. There were ten members of MTCF invited to the seminar. Mr. Omer Tarzi, Pcess India d’Afghanistan, Pcess Leyla d’Afghanistan, Pcess Nagia d’Afghanistan, mrs. Melike Tarzi, H.E. 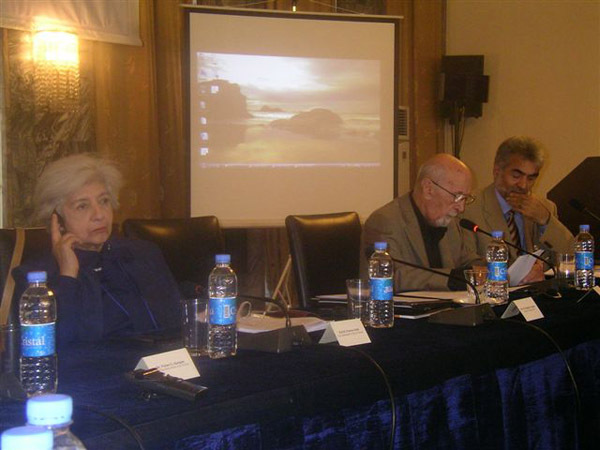 dr. Ravan Farhadi, Sculptor&Painter Omar Berahna Massoum, scholar Bashir Sakhawarz, mr. Azarakhs Hafezi and mr. Seddiq Rahpoe Tarzi. In the end of the seminar we received concluding remarks from the different international scholars, diplomats, described the result of the conference valuable for the Afghanistan and Afghan nation. It was a good chance to feel Mahmud Tarzi’s deep love to his country and people,once again in the seminar. Conference closed with a speech of Pcess Leyla d’Afghanistan member of the MTCF trustee, thanking to dr. Spanta and his organization committee and to all participants on behalf of the MTCF and after this mr. Omer Tarzi presented foundation high rank award of MTCF madallion to the dr. Spanta. H.E. Dr. Spanta in his closing remarks appreciated the President for his sincere and heartfelt efforts in helping the Foreign Affair to organize this important event and thanked to the participants. 75th Memorial Anniversary of Mahmud Tarzi programmes will continue in several countries until 23rd November 2008/ 3 Kaus,1387 . There will be closing programme in Istanbul on 22nd and 23rd November/ 2-3 Kaus 1387. programme details will be informed soon. From the outset, I would like to welcome you to the International Conference on “Establishing Afghanistan’s Modern Diplomacy: the Influence of Mahmud Tarzi and Vali Khan Darvazi”. This place holds special historical and symbolic significance andmeaning for us, particularly for the anti-colonial and reformist movements. One of the offices of HE King Amanulla is located here as well as Afghanistan’s first foreign minister late Mahmud Tarzi’s office. 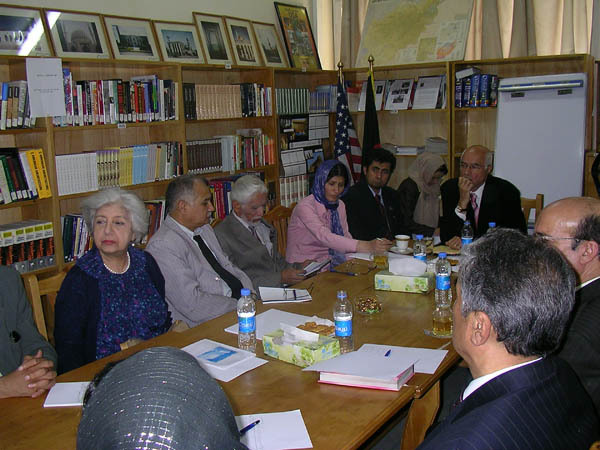 Many discussions and declarations associated with restoring Afghanistan independence took place here. The office of our second foreign minister, the great reformist, late Mohammad Vali Khan Darvazi, as well as the place of his unjust trial are also both located here. Today we have gathered here to examine the thoughts and roles of two of Afghanistan’s great personalities of the twentieth century Undoubtedly, there existed many common characteristics as well as notable differences between the one who was deprived of his civil rights and the one who lost his life While Mahmud Tarzi is a man of thinking and contemplation with an interest in implementing his reformist and enlightened ideas, Mohammed Vali Khan Darvazi as a diplomat, a reformist, a patriotic and the King’s senior confidant is a man of implementation and practice. The process of Enlightenment and efforts to overcome our historical underdevelopment and anti-colonization are associated with Mahmud Tarzi. After years of exile and forced deportation, Tarzi returned to his homeland with new acquired knowledge and exposure to the Enlightenment ideas The beginning of the twentieth century witnessed the emergence of constitutional movement and reforms process in some Muslim nations, including in the Ottoman Turkey The great French Revolution and the Enlightenment ideas offered a new hope to the reformists in the land “the sick man of Europe’, which was inflicted with the curses of colonization, authoritarianism and underdevelopment. The liberating message of “Equality, Liberty and Fraternity’ overwhelmed many reformists and intellectuals of these lands The autnoritarian beliefs and systems who ruled for centuries over men’s bodies and minds were confronted with the principle of “people sovereignty’. The late arrival of Enlightenment ideas and promises to our nations was compounded by their association and utilization by the colonial powers. In other words, the modernity and Enlightenment tn the East were not home-grown. It was primarily an effort by the colonized orient to overcome their defeat by acquiring the tolls and products of the Enlightenment and modernity. Any other interpretation is a misreading and misinterpretation of the history. The contemporary anti-democratic forces also suffer from this fundamental contradiction, which is to confront the essences of moderntty with its tools and products. Technical modernity and instrumentalized rationalism fully embrace advanced modern weapons or latest high tech products and facilities since these products make their torn and confused lives more comfortable. In their view, however, the problems are modernity’s belief and insistence on humanism, human rights, gender equality and the sovereignty of man. From its dawn to the present day, the opponents of modernity have despised the fundamental pillar of modernity, which is the independence and autonomy of man from all socially and politically constructed imposed rules and mastery. 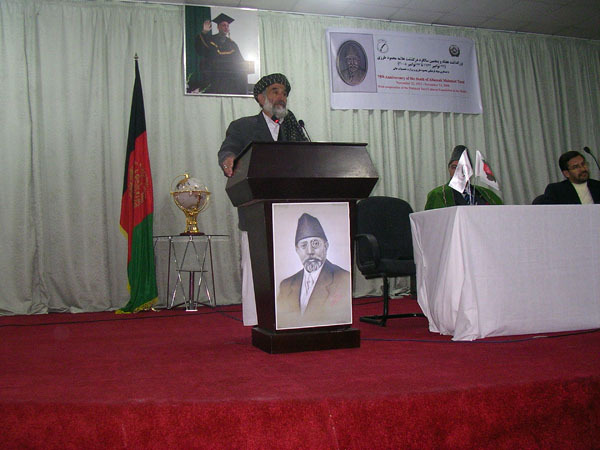 It is imperative that wc contextualize the views and efforts of Tarzi in order to assess his achievements and also the constraints that he was subjected to As a journalist, a poet, a writer, a translator, an intellectual and a politician his multidimensional personality have made him one of Afghanistan s historical personalities. He was the first statesman who laid down the foundation of a national government based on people sovereignty and citizens rights. His efforts are more appreciative when we realize that he was pursing his objectives in time when the palace was filled by the colonial’s agents and puppets. His nationalism brought him to direct confrontation with the forces who did not want to accept new changes, ideas and institutions that were blossoming in the Occident following the French revolution. The constitutional and modernity movement in Afghanistan cannot be studied without taking into account the role and contributions of Mahmud Tarzi and his courageous companions such as Vali Mohammed Khan Darvazi, Abul Rahman Ludin. Abdulhadi Davi and many more who lost their lives to the noble causes of independence and constitutionalism. 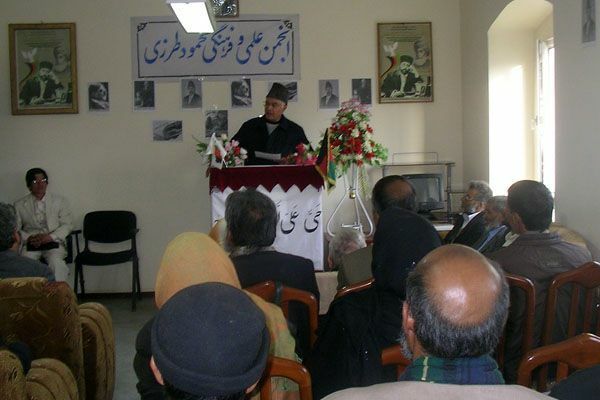 Vali Mohammad Khan Darvazi is one of leading figures of cur independence movement. He was a great statesman, a confident patriot, a reformist and a well-known anti-colonial Afghan. 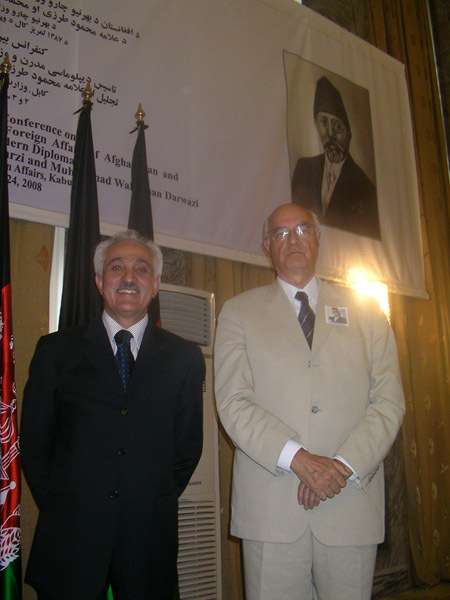 As the non-resident Afghan ambassador he succeeded in establishing diplomatic relations with a number of European and Asian nations He was a true representative of newly independent and progressive Afghanistan. By taking advantage of all available options, he conducted his official engagements on equal basis with his European counterparts. Mahmud Tarzi wrote to him,”…no one else could manage our Ministry of Foreign Affairs like you”. Painfully the ensuing authoritarian rein following Darvazi’s execution prevented people to fully appreciate him. The King Amanulla’s rein has been a blossoming period for Afghanistan thanks to the progressive ideas and tireless efforts of Mahmud Tarzi, Mohammed Vali Khan Darvazi and Abulrahman ludin. From the establishment of the council of Ministers, national assembly and modern judicial system to the establishing diplomatic relations and introduction telephone, radio. Railway, theater to introducing progressive legal measures and initiatives such as banning slavery, under-age marriage and sending girls to overseas for education. The main difference between the reform movement during the Amani period and ensuing efforts to date was that the former was essentially an anti-colonial movement and aimed to achieve self-determination. The anti-colonial movement was accompanied by the King Amanulla’s determination to escape from the yoke of underdevelopment and backwardness. By doing so, he had to confront the traditional forces and the British colonialism As a result, the flame of a new emerging progressive Afghanistan was distinguished by the forces of colonization and authoritarianism and many of its leading founders were severely punished by the succeeding regime. However, it my view, the reality is far more complex. The main internal reason for the failure was the historical gap between the state and traditional, autonomous and closed societal structures of the society. The absence of a general knowledge about the complex social and cultural structures and interactions was the main obstacle towards reforms. In such closed and re-producing cycle the most vicious and violent ideological forces are reproduced by borrowing legitimacy and support from the traditional elements. The penetration into such deep, closed and self-reviving structures is a challenging task. They cannot be easily broken by their internal dynamism External pressures also often lead to strengthening their structure The reformists are either too small or to weak to break this cycle. In other words, what led to the collapse of the King Amanulla’s reforms were a combination of external factor, internal resistance and the weakness of the reformist movement. Today, we face with similar challenges and obstacles. On one hand we are struggling with the pre-modern forces equipped with modern weapons, which are being utilized for the pursuit of Pakistan’s hegemonic objectives and Al Qaheda transnational fundamentalism s goals, on the other hand the ethnicisation of political discourse: the weakness of modern social relations and institutions are inhibiting us to break the vicious cycle of anti-reform in Afghanistan. However one cannot be too pessimistic We can see the gradual loosing some parts of this vicious cycle in recent years by the emergence of human rights, democracy, social justice and rule of law discourse. Once again many thanks for accepting our invitation. I hope the discussions and deliberations of this conference shed light on some aspects of our recent history. Welcome to Kabul and have a productive conference. It is a great pleasure for me to be here in Kabul today to recognise the 75th memorial anniversary of Mahmud Tarzi meetings under the shinning celebration of independency. With this occassion I extend our deep respect and sukran to King Aman Ullah who brought independence to our country in 1919. We are particularly honoured by the presence of the President/ministers whose leadership and ideas have contributed so much to improve the quality of life and economic well-being of the citizens of Afghanistan. I again deliver our deep appreciation to the President who released a jerib of land to build MTCF HQ and research center of Afghanistan, in Kabul. In this week we are happy to put a cornerstone on this land to start the construction soon. I would also like to express special thanks to my brother the Foreign Minister, H.E. dr Spanta, in organizing this important event and facilitating the presence of so many people from different parts of the world. Many of our international guests have prominent and responsible positions at home and their presence here honours us. Today we gathered here to respect a man who brought light to the Afghan nation about 80-85 years ago. But he represents much more. His efforts were limitless. He was the father of journalism, a respected diplomat, the first foreign minister and ambassador. Besides these; He had a strong pen, wrote prose and poetry for his people and for his country, translated many books from other languages to bring the good winds to his people. A man that helped us move towards the future !!! He was Sardar Mahmud Tarzi. I believe most of the speakers will give more details about him during this seminar with their valuable interpretations. Today is a very important day in Afghan history. After many years, this is the first official celebration ceremony for Mahmud Tarzi and for his memory. The schedule of this memorial period will last until the 23rd November 2008 in several foreign countries and the closing ceremony will be held in Istanbul in front of his tomb with a serial of conferences. There will be a joint program of Istanbul Literature Faculty together with Kabul Literature Faculty including international scholars. MTCF is organising a contest “ Mahmud Tarzi’s life and struggles” between the two faculty students. With these activities our grandchildren will learn more about him and his struggles, what good he had done for his country. Mahmut Tarzi was a man who felt himself responsible to bring civilization, modern state management philosophy and more healthy living style to his people. All of which collectively important to create a humane and socially-supportive built environment to raise the quality of life. It is therefore most appropriate that this event is taking place in Afghanistan, a country rich in cultural heritage and pluralistic traditions. 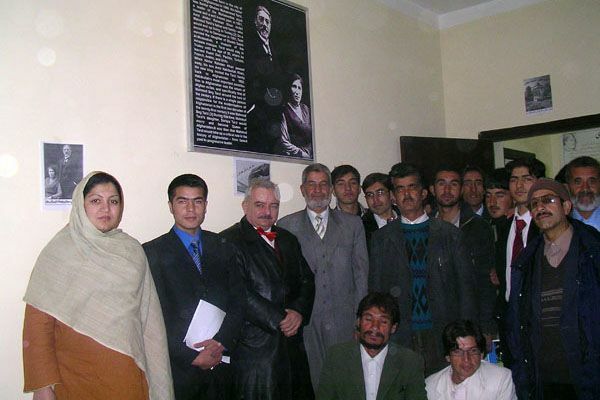 It is now 3 years since the Mahmud Tarzi Cultural Foundation established in Afghanistan. From the 1st day on we were supported by every office in the state organization as well as by the civilian Afghan institutions and people of Afghanistan. 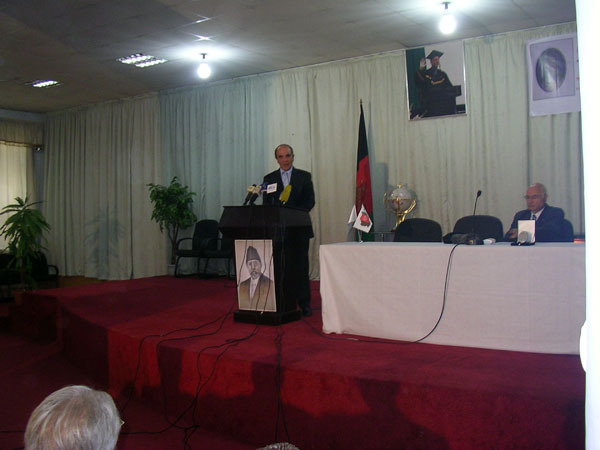 MTCF is an pure Afghan origin foundation,its headquarter is in Kabul. Founders of MTCF are 3rd generation of Mahmud Tarzi family members. Please allow me to give you a short information about his family. He had ten children from his respected wife Asma Resmiye, 5 sons and 5 daughters. Unfortunately all deceased except her daughter, princess Amina Seraj in her age 93 and happly living in Istanbul with her family. Another gentleman and former Education minister and ambassador H.E. 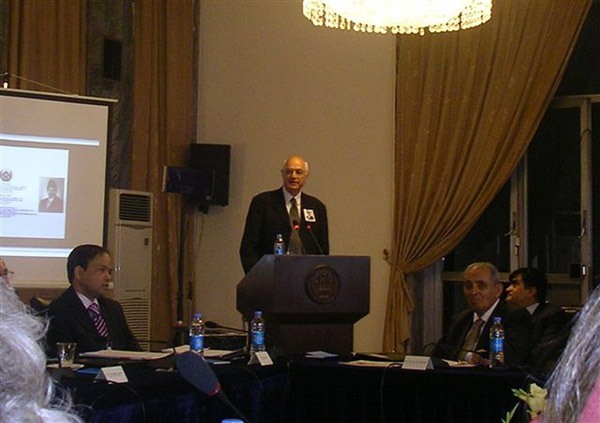 Hamid Ullah Enayat-Seraj who is my cousin, is honorable chairman of our foundation. We received valuable advises from him. I personally called and invited him for this meeting but he was unable to travel these days and sent his very warm salams and ehterams to each one of you and appreciation to the organization committee. 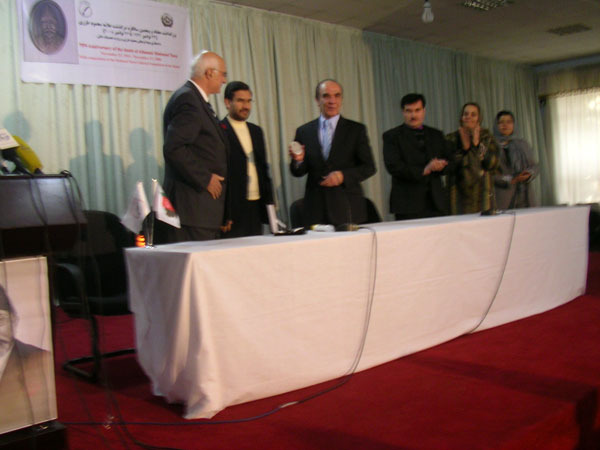 When we decided to launch the foundation all grandchildren of Mahmud Tarzi approved and signed the establishment agenda. Then we informed this development and establishment of the foundation to all Tarzis and received also their warm support . We then applied our documents to Afghan government to start the establishment process. At this stage it is my duty to express our ehteram and gratitude to H.E. Raheen, former minister of Culture, for his very warm assistance with his support. Here I kindly also express our deepest appreciation to H.E. Amin Farhang who gave us our certificate immediately without any problem. He is a true friend of mine and I always appreciated his positive efforts for our foundation. Afghanistan is an important country in mid Asia and I strongly believe, it is the answer why we have so many guests living with us since years in our land. In Islam, the Holy Koran says that, “man is God’s noblest creation” to whom He has entrusted the stewardship of all that is on earth. Each generation must leave to its successor an enhanced and sustainable social and physical environment. One of our objective is not to loose identities and their inspiration . We must take care not to absorbe imported forms but to put our owns to match with others. This is very important point to be recognized by all people. I am sure every responsible citizen in every part of the world will share this aspiration. So we must trust ourselves, we must work together, we must live together without any separation. This is our country and there is one country and one nation for Afghan people. If we do this we become strong and do good things for ourselves and for our country.. I am therefore convinced that supporting diversity and cultures under threat is a worthwhile and fruitful venture. In these two days we shall observe and share some valuable speaches from respected researchers for Mahmud Tarzi and his works. Before entering this section, I want to add that we live in 21st century and is important to discuss influences of Mahmud Tarzi’s ideas to the present world and people. At the end of this session we shall see that all his ideas are still fresh and useful for us. World is a much better place because it is pluralist and multi-cultural. And it is vital that we can make our country more stable after the lessons we have learned from the world. That means we need to build an all encompassing profile of people and habitat, not only in the Islamic world, but in countries where Muslims live and interact with other communities, both urban and rural. There is another page of story in Afghanistan the “generation that lost its childhood” vowing to help those, forced by war and poverty into militias,early marriage or onto the streets. More then half the population of Afghanistan is under the age of 19 and they want to live in stability and peace. They have lost much-loved ones, homes, playmates…they are the generation that lost its childhood !!! Now we must work for them, to build a country for them. MTCF has various goals and aims. We run scholarship programmes, we receive funds to renovate our school MTHS, to make one of the leading school in midasia. We work on a big project with international consultants to build a compound for the foundation which includes streetchildren rehabilition center and women care center , a library and a museum. We work on a financial project which includes a cardiovascular hospital, hotel and congress hall. We shall receive our necessary budgets from these facilities. And with all these we bring hope and courage to our young generation to live in better conditions insallah! But while we can be pleased with this progress, there is much more to be done. We are not an ordinary /as they call NGO/ or instutition looking for help a one time business or work only for itself. 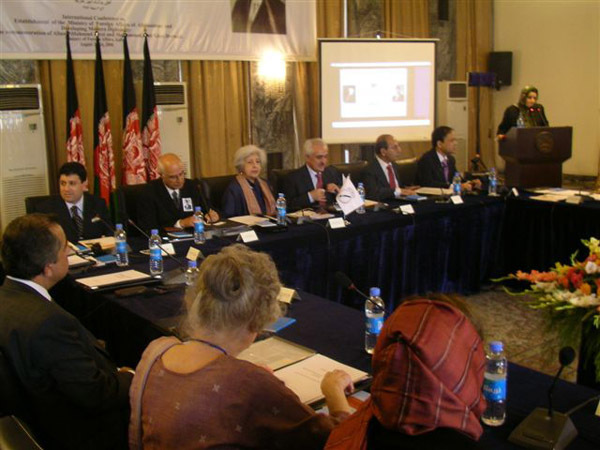 We are an Afghan foundation, managed by international high level business professionals who are Afghan. Our projects will bring additional value to whole country for local needs. Projects will bring a certain prestige to our country and of course physical benefits. The Muslim world is multi-cultural, diverse in geography, terrain and climate and it exhibits extremes of wealth and poverty. This diversity forces us to be sensitive not only to local needs, but to local capacity and resources available to meet those needs. I hope that the lessons learned in the process we have established, would be applicable to the many others in similar circumstances. Perhaps these lessons will one day be seen as an important contribution by the Muslim world: A contribution to the broader cause of maintaining and enhancing a multi-cultural, pluralist world and a responsive, appropriate human habitat. Mahmud Tarzi family members and MTCF strongly accept the aboves, which I mentioned. We carry his blood and we know him very well, what he said and meant and did. He is in our soul, deep inside. We are aware what kind of responsibility we have for our country, for the whole Tarzi family and specially for him, for his name. Therefore we need your sincere approach, participation and presence in the foundation to share these responsibilities . This is our foundation to work for the good of the people of Afghanistan. Anybody who brings offer for the good of MTCF is welcomed by the foundation. We are professionals and easy people to negotiate but very sensitive to decide.